When you think about Memphis dining, of course famous Memphis BBQ immediately comes to mind. And no wonder. Memphis is full of outstanding BBQ spots specializing in the city’s signature slow-cooked, dry-rubbed pork ribs, but Memphis is also now becoming a culinary hot spot for a variety of exceptional restaurants with a wide range of cuisines from Southern to Italian, Asian to Creole and beyond. 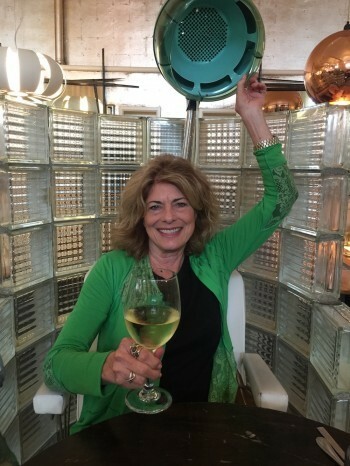 A fellow food writer, Linda Milks, and I recently visited Memphis and for three delightful days we savored some fabulous food in this city, which is fast becoming well known for its cuisine beyond BBQ. After all, we needed nourishment between stops at some of Memphis’ most well-known destinations, such as Graceland, Sun Studios, and the National Civil Rights Museum. (More on what to do in Memphis in another article.) 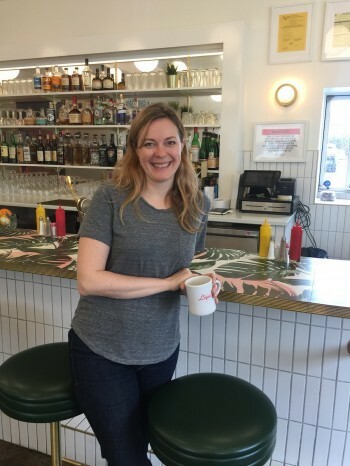 My son lives in Memphis so I had been to some of these restaurants before, but it was great to enjoy them from the perspective of a food writer. And it was gratifying to have my perception of Memphis as an up-and-coming culinary mecca confirmed. Opened by celebrated restauranteurs, Michael Hudman and Andy Ticer, Catherine & Mary’s (named after their grandmothers) occupies a spacious, modern space in a beautifully restored apartment building in the heart of bustling downtown Memphis. We first sipped craft cocktails at the expansive bar and then perused a diverse menu featuring Italian items, sometimes with a Southern twist. 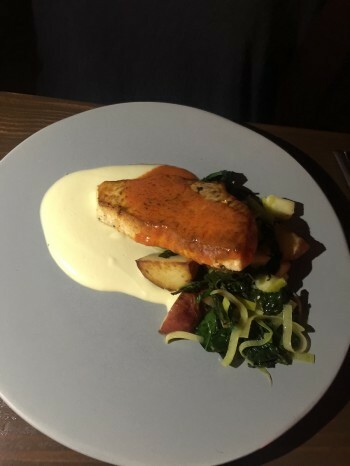 Linda enjoyed the fish of the day—delicate swordfish sitting atop a savory cream sauce with a tangy red sauce on the side. I loved the flavorful Clamarata Pasta featuring prosciutto, Calabrian chiles, gorgonzola and mushrooms. For dessert, we shared a delicious goat cheese cheesecake creatively topped with an apple strudel mixture. There are other fabulous restaurants in Memphis established by this talented team, including their original and still thriving upscale restaurant, Andrew Michael Italian Kitchen, which was a James Beard award finalist for Best Chef in the Southeast and Hog & Hominy, a casual, hopping spot where I have dined frequently. I love their thin-crusted pizzas, particularly the Margherita pizza, and their innovative take on Poutine with neckbone gravy and cheese curds. 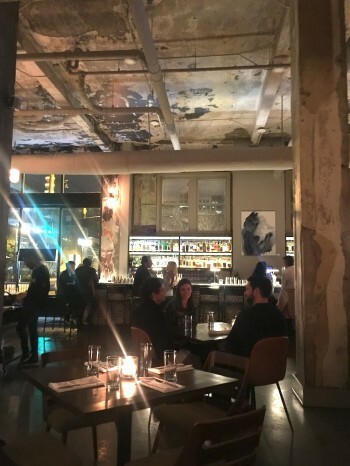 And during my recent visit, we dined at the duo’s newest stylish restaurant located inside the Old Dominick Distillery, The Gray Canary, where my son and his wife raved about the oysters and I loved my pasta dish. Before dinner on another evening, we enjoyed strolling around the Crosstown Concourse, a huge multi-use renovated Sears distribution center that now houses offices, retail outlets, apartments, and restaurants. We admired the open, welcoming space and thought about how much fun it would be live there. After exploring an art gallery, coffee shop, and enticing grocery store with unique specialty items, we found our destination: Next Door Eatery that prides itself on serving “real food sourced from American farmers.” After enjoying margaritas and guacamole at the bar, we perched on stools at a high table in this casual, open setting and enjoyed delicious burgers. We learned that Next Door's kitchen is set up to meet all dietary requests from gluten-free to vegan. The menu is innovative and includes such appealing dishes as Grilled Broccolini, Roasted Balsamic Beets, a Salmon Burger, and a variety of creative bowls such as Honey Sriracha Crispy Gulf Shrimp and Slow Cooked Meatballs. The Liquor Store is not what it seems. 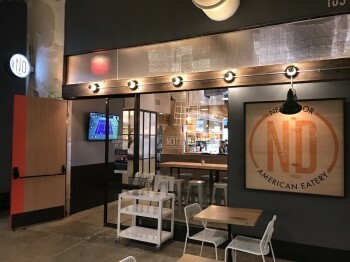 Located in a building that formerly housed a liquor store in the hip Broad Street Arts District, it is now a casual, diner-like spot offering creative breakfast, lunch and dinner items along with craft cocktails. The dishes are clearly Southern, sometimes with a Latin flair. The setting is cheerful with tropical accents. The story about how the financing of this venture came to be is an inspiring one. The Liquor Store is owned by Lisa and Luis Toro. When they were initially unable to obtain traditional financing, Lisa and some other female entrepreneurs formed the Broad Angel Network designed to help develop investment opportunities for minorities and women in under-served Memphis neighborhoods. With the support of this venture, Lisa and Luis were able to finance and open their restaurant. Lisa greeted us warmly when we arrived. Her passion for her restaurant was contagious. Even though we were there for breakfast, we decided to try a popular cocktail called Matcha Milk Punch, made of a combination of luscious ingredients, including rum, milk, honey, cinnamon, matcha and mint—so unique and so delicious. The wide variety of coffee concoctions was also appealing. 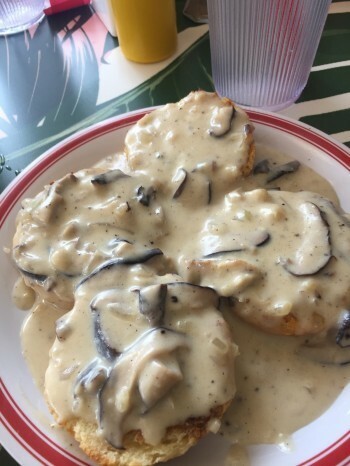 Since biscuits and gravy is always one of my Southern favorites, I ordered The Liquor Store’s imaginative, vegetarian version with shitake mushroom gravy. 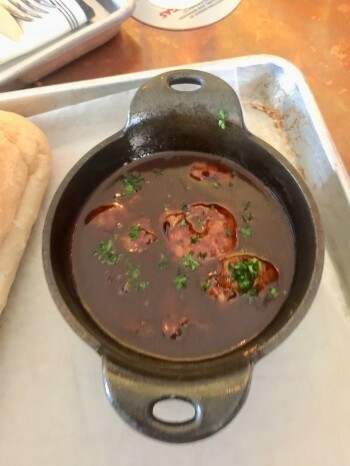 I absolutely loved the creamy earthy sauce and the buttery, house-made biscuits were wonderful. We also sampled several other special dishes, including a savory Sweet Potato Hash made with sweet potatoes, spinach, and caramelized onions with two sunny-side-up eggs perched on top, and the Cuban Platter (with an option of pork or chicken) served with black beans, yellow rice and fried plantains. 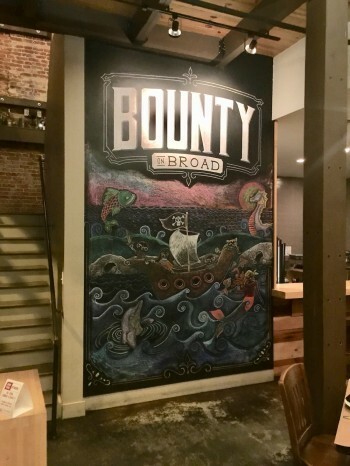 Bounty on Broad is one of my favorite Memphis restaurants. I have eaten here several times and always love it. 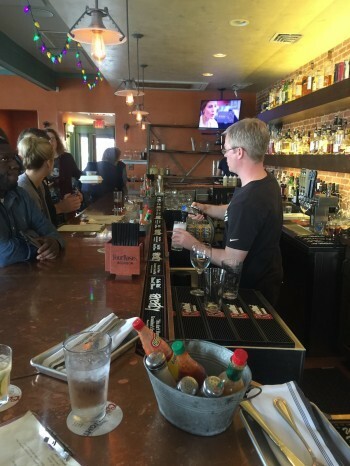 Located up the street from the Liquor Store in the same vibrant, evolving Broad Avenue neighborhood, the decor is rustic chic with exposed bricks and wood accenting an open, upscale but comfortable setting. 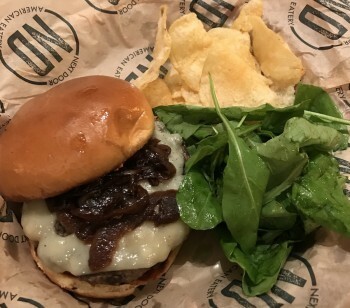 The menu is diverse and imaginative, with an emphasis on locally-sourced, fresh, seasonal ingredients, and includes many gluten-free dishes. Dishes are served family style, perfect for sharing. We started with cornmeal-crusted Fried Oysters that were crunchy and tasty. We also loved the Cauliflower Au Gratin served with a bechamel and white cheddar sauce and topped with crispy onions. But the highlight of the evening’s meal was flavorful and delicious Braised Pork Shank served with smoked gouda grits and turnip greens. It must be a thing in Memphis to name a restaurant after its building's original purpose (such as The Liquor Store). The Beauty Shop, located in the trendy Cooper-Young district of Midtown Memphis, has retained the spirit of its earlier days with a retro décor accented by mint green shampoo basins and vintage hair dryers. We were especially impressed to learn that Priscilla Presley used to have her hair done here when she was a teenager in the 50s and 60s. Customers can sit in cozy glass brick alcoves under original hooded hair dryers. The menu is as unique as the décor with a decidedly Southern flair and even a few Asian touches. We enjoyed the corn fritters as an appetizer along with creative cocktails. (I relished my cocktail called Please Please Please, a refreshing concoction of vodka, St. Germain, and grapefruit juice. I loved my B,L,FGT & A sandwich (bacon, lettuce, fried green tomato, and avocado) with shrimp. Linda raved about her Thai Cobb Salad with crispy duck, lettuce, tomatoes, eggs, green beans, beef jerky, avocado, mango and gouda accompanied by a house-made green goddess dressing. On our next visit, I plan to try Watermelon & Wings, described on the website as “chicken wings dipped in white Szechwan pepper and sweet chile lime juice, brushed with sugar, then deep fried to incredible crispness and tenderness, and served with chunks of luscious sweet watermelon, sprinkled with toasted cashews” — a very Southern dish that sounds heavenly. Second Line features New Orleans cuisine and gets its name from the “second line” of New Orleans’ more meandering parades. Owner and chef, Kelly English, who also owns Restaurant Iris right next door, another Memphis culinary treasure, grew up in New Orleans and describes his restaurant’s cuisine as “casual, honest, delicious and true.” The setting exudes a Creole/Cajun intimate ambiance with brick walls and warm lighting. An outdoor patio was appealing, but we sat at the inviting bar with a friendly bartender. 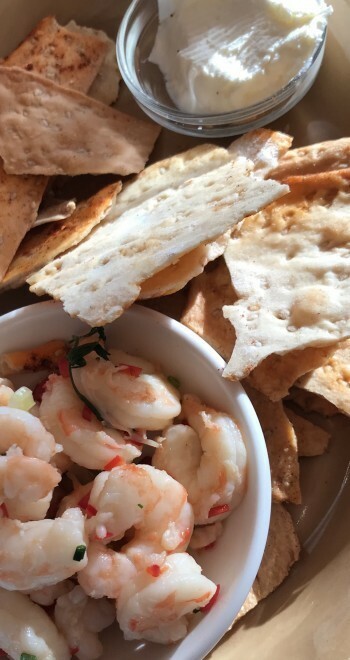 We whetted our appetites with a barbecued shrimp dish, which was spicy and flavorful. Then Linda tried the Oyster Po Boy topped with shrimp and breaded fried onions and I savored the Shrimp Po Boy. We were immersed in NOLA for a few hours and enjoyed every minute. 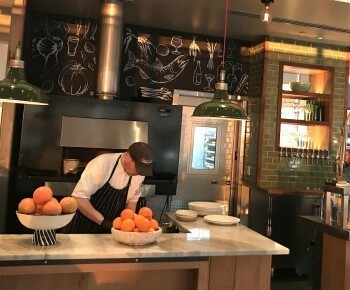 The founders of Next Door, Hugo Matheson and Kimbal Musk, also established The Kitchen, focusing on farm-to-table cuisine. Located on the lovely, expansive grounds of Shelby Farms Park, a sprawling urban park that is five times larger than Central Park in New York City. We visited The Kitchen early one evening to enjoy the sunset from the restaurant’s outdoor patio overlooking a beautiful lake. On this visit, we sipped cocktails and enjoyed appetizers, including deviled eggs with smoked salmon, shallots, dill and capers and also pickled Gulf shrimp with chilis, creme fraiche and lovosh crackers, but on other visits I have savored a variety of other fresh, interesting dishes, including crispy salads and beautifully prepared fish and meat entrees. The food is healthy and delicious and the setting serene. 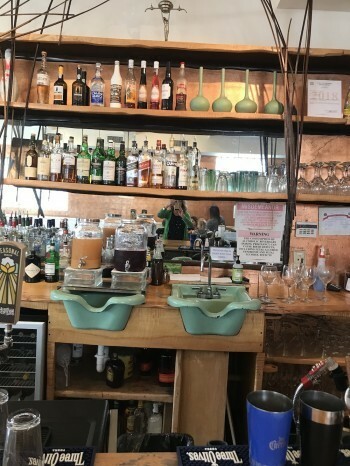 Our group especially enjoyed the restaurant's craft cocktails, such as the Blackberry Bourbon Sour (bourbon, blackberry syrup and lemon) and Persian Lemon (vodka, pomegranate liquer, pineapple and lemon). It’s hard for me to imagine a visit to Memphis without stopping at The Kitchen. And finally we had to try at least one authentic BBQ place. 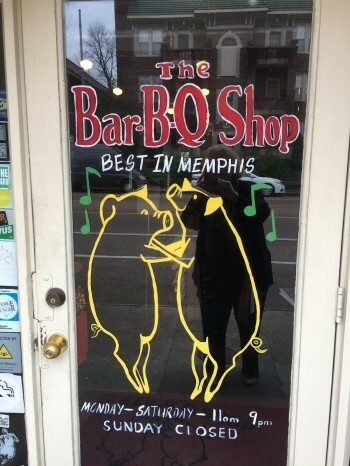 We chose The Bar-B-Q Shop, based on my son’s recommendation, but of course there are countless other wonderful BBQ options in Memphis. We relaxed in the casual, welcoming setting and appreciated the helpful staff as we tried to decide on just which rib options we would order. We each had a beer since that was the only alcohol on the menu, but the cold beer hit the spot after a hot day of sightseeing and beer was the perfect accompaniment to our flavorful ribs. We also tried refreshing sweet iced tea. (You can’t miss this Southern favorite while in Memphis.) We ordered a slab of tasty, tender ribs and just had to try barbecued spaghetti, a dish unique to Memphis, which the restaurant claims was founded right at the Bar-B-Q Shop. The ribs come wet, dry, glazed or half & half. We tried dry-rubbed ribs with sauce on the side. Our order came with beans, slaw and Texas Toast (thick toast grilled with butter and garlic). 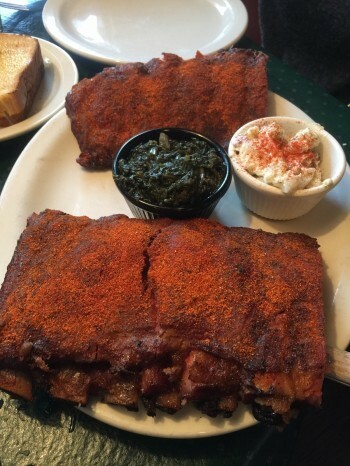 The order was so huge we couldn’t finish it no matter how much we loved the ribs—and we did love them. While the barbecued spaghetti was good, we both decided that we would rather have our BBQ sauce on the ribs. This list of great Memphis restaurants is just a teaser, but you won’t go wrong with any of them as you explore this city's appealing cuisine. Please check the links to these restaurants’ websites for locations and hours. Photos by Linda Milks and Susan Montgomery.